Landsknechte (German plural, singular Landsknecht) were mercenaries from the late 15th to the late 16th century. Knecht, meaning servant, helper, or stooge, was also used for the paid foot soldiers that were to be known as the Landsknecht. The format of the German mercenaries was inspired from the Swiss army, as was the dress fashion. Swiss mercenaries were called Reisläufer, and you can use the slashes to spot the difference between them: Germans had “x” slashes and Swiss had “+” slashes. The tross were the camp followers who traveled with each Landsknecht unit, carrying the military necessities, food, and belongings of each soldier and his family. The tross were made up of women, children, and some craftsmen. 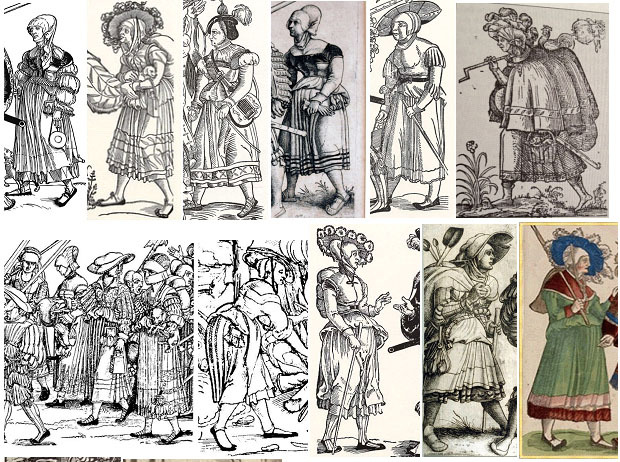 The name of the women traveling with the landsknecht came be known as kampfrau or trossfrau. Neither is a period name even though today they are used to describe the group of “females hanging with the landsknechts”. Just before this class I took a long discussion with Meisterine Katheryn Hebenstreitz, about what to name to use for all those women who follows the Tross, and decided that Trossfrau, seem more accurate then the word Kampfrau, and therefore that is what I have decided use in this hand out. Feel free to use the term you like, the important issue is that other people know what you are talking about. The fraue was the person the Landsknecht was legally married to, even though they also had a sort of fake marriage that happened when the leaders tried to regulate the number of women following the tross. Since the war campaigns usually started during spring, this kind of marriage was known as a may marriage and the wife known as mai fraue. Whure was a women who wasn’t married to the man she followed, kind of like a modern partnership with a man and a women. Dirne was the prostitute who made her living by selling her services, and they even could be found in the payrolls as a legal worker during the war campaigns. Some men left their wife at home while they in the field had a mai fraue or a whure who helped him and took care of him during the war campaign. The women also took part in the looting of the battlefield as a way to make some extra money for living. Some of the women also had a professional role in the camp as neterin (seamstress) or lautenschlagerin (lute player), etc. The most popular theory about the elaborate dress is that it started as loot from the battlefield, and was then altered to fit the new wearer. A new leg replaced the old one, a piece of brocade became a trim, etc, which can be done easiest by slashing the parts that might be too tight. The style of dress later developed and eventually became so flamboyant that Kaiser Maximilian I exempted it from the prevalent sumptuary laws as an acknowledgement of their “…short and brutish” lives. One theory though claims that Kaiser Maximilliam had trouble controlling the Landsknechts and therefore gave them the freedom to dress as they wanted rather than seem like a weak ruler. Remember… your dress doesn’t have to be an exact copy of a 16th century woodcut, you are free to cut any corners you want to – but always be aware that you also are part of someone else’s dream. The small picture of paintings and woodcuts are not necessary an image of a Trossfrau (as you probably noticed), but added to give you a broader perspective of the different construction and appearance of the 16th century German dress. The head-to-toe woodcuts under the section “The dress”, are all images of a Trossfrau. The Gollar is made out of wool and lined with linen, and often just covers the top part of the body. It can be pointy in the front, have a high neck and be worn open in the front. It has usually decorative trim, and can be lined with fur. The Apron is made out of a rectangular piece of linen, with pleatwork embroidery (smocking) at the top, using the same pattern as seen on the chemise. The early recreations of a split Trossfrau dress (separate jacket and skirt) were probably a misinterpretation that the apron was a part of the chemise visible in the waistline. You can find three different kinds of aprons: as a skirt, as a rectangular piece in the front, or as one with two rectangular pieces sewn together in the sides and pleated in the top and with bands over the shoulder. The pouch is made out of leather and has several compartments. The chemise, or shirt, is made out of linen, with pleatwork embroidery or smocking. The chemise can be either low cut or have a high neck collar and comes to mid thigh. The chemise is made out of rectangular shapes gathered by the smocking around the neck line and cuffs. The pattern for the chemise is usually based either on the Sture Shirt findings from Sweden and the fragments from Alpirsbach monastery in Germany. The chemise is basically unisex, except for the few examples that have more smocking on the sleeves. The dress is a fitted bodice with a contrasting colored trim, which hides the stitches from the closing (either laced or hooks and eyes). It has long sleeves and some woodcuts indicate that the sleeves are attached to the dress by ties. The skirt is made out of a gathered tube, either with rolled pleats or double box pleats, and has often two stripes in a contrasting color (some woodcuts indicate the use of brocade). The woodcuts shows that trim, stripes, and sleeves are sometimes slashed, either the ‘x’ or the ‘+’, but also only a simple ‘/’ (which doesn’t necessary means that the dress actually was slashes, but instead was a way pointing out if she was either a German or a Swiss). The outer dress is made out of felted wool and the bodice is lined with one layer of linen. The slashes are either white silk or linen, depending on your budget, but many of the pictures may indicate that it’s actually the chemise you see through the slashes, and not added puff. But if you study upper class clothing, you can clearly see that the puffs are made by adding extra fabric sewn into the dress between the lining and outer fabric. If you want to add extra puffs, then silk is recommend for the sleeves or any other places that you want to puff them a bit more. Linen looses the puffiness, attracts dirt easier, and is heavier than silk. The skirt is hoisted up by a belt worn over the hips, letting you use the opening in the front as a pouch. The Trossfrau rarely had any complex double puff/slashed sleeves, their dresses are usually very simple without the decorations that the male garb had. The underskirt is made out of linen and is a plain tube pleated at the waistline, and can have one or two stripes in a contrasting color. The hose were sewn out of thin wool, and held up with a band above the calf/knee. The hose can either be in one colour or several. The Shoes (Kuhmaleshoe = cow nose shoes; from the similar shape) has a specific flat front part, usually one band crossing the foot, but could also be more rounded as a modern shoe. –	http://www.wikipedia.org–Basic info about the Landsknecht and high resolution pictures of woodcuts, and don’t be afraid to try to search in a different language, it will give you a good start to find more pictures and inspiration. This entry was posted in Trossfrau and tagged Collar, Dirne, Dress, fraue, hat, haube, mai fraue, Puffs, Shoe, Slashes, stuchlein, Trossfrau.